Talk about black with a half-inch of head on top. The head retention could be better, as it quickly falls to a lace. The aroma of bitter hops and cocoa powder says American-style, and it's done very well. The taste brings more of its malt to the table starting with the flavor of chocolate powder. Cocoa is more defined. It still brings some hops, more specifically hop leaves and resin. Despite the 5.5% alcohol, the beer has almost a chewy texture and is full bodied. 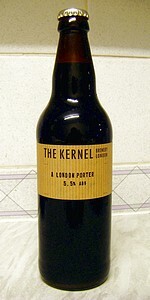 Kernal's porter is worthy, and well-fitting at the Beer Temple. Maybe one day I'll see their beers in the US, but for now I'll settle for this one taste. Purchased at an Odd Bin chain wine shop in London recently; bottle-conditioned in a 500ml brown bottle, BB 11/09/2011, served cool in Gulden Draak's tulip shaped sniffer. A: pours a very dark brown colour, topped with a dark beige froth that settles slowly to a thin rim to last; carbonation is light but constant. S: aromatic in terms of roastiness, with hints of light coffee, treacle, fresh & sour-ish berry fruits, and a bit of Fuggles hops in the remote corner. T: lightly sour and bitter-sweet, lightly nutty or bean-ish apart from the lightly roasty coffee-ish taste, then the dry-ish & bitter-ish palate of hoppiness expands and mixes well with a lasting fruity sourness that provides just enough "edge" to balance the roasty aroma felt vividly down the edges of the tongue... somewhat chewy in the finish, too. M&D: very well bottle-conditioned, unlike the Pale Ale I had which was purchased at the same shop; the palate is refreshing, the carbonation smooth, and the body balanced, medium-ish, matching well a gently-flavoured profile all in all. More like a traditional Porter, I would say, and very drinkable this is.